dOto-Rhino-Laryngology, Interdisciplinary Center for Vertigo and Balance Disorders (S.C.A.H. ), University Hospital of Zurich, Zurich, Switzerland. BACKGROUND AND PURPOSE: Endolymphatic hydrops has been recognized as the underlying pathophysiology of Menière disease. We used 3T MR imaging to detect and grade endolymphatic hydrops in patients with Menière disease and to correlate MR imaging findings with the clinical severity. 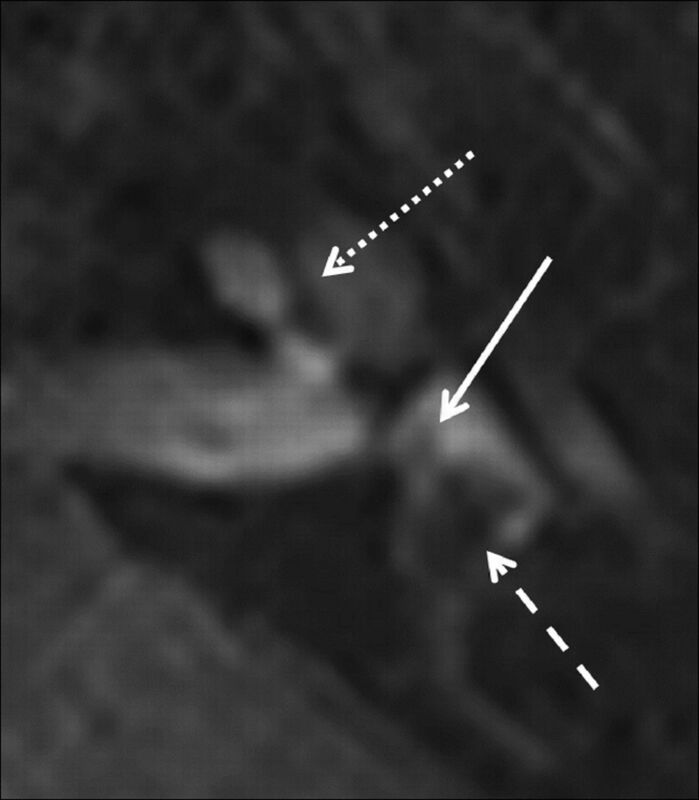 MATERIALS AND METHODS: MR images of the inner ear acquired by a 3D inversion recovery sequence 4 hours after intravenous contrast administration were retrospectively analyzed by 2 neuroradiologists blinded to the clinical presentation. Endolymphatic hydrops was classified as none, grade I, or grade II. 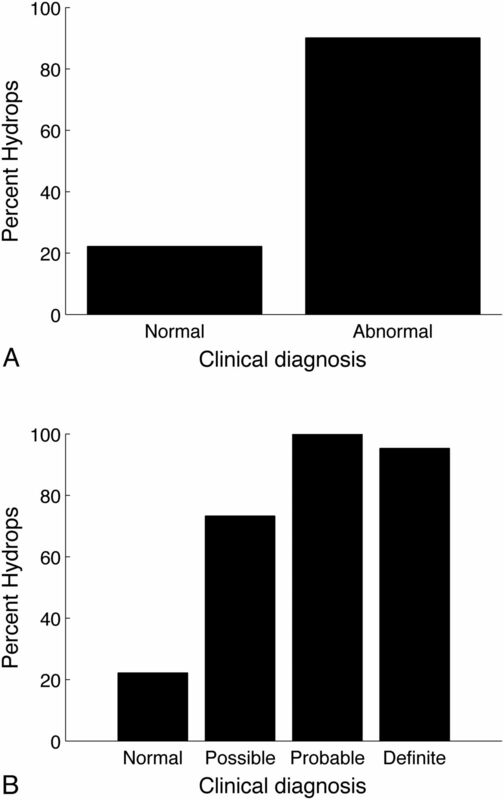 Interobserver agreement was analyzed, and the presence of endolymphatic hydrops was correlated with the clinical diagnosis and the clinical Menière disease score. RESULTS: Of 53 patients, we identified endolymphatic hydrops in 90% on the clinically affected and in 22% on the clinically silent side. Interobserver agreement on detection and grading of endolymphatic hydrops was 0.97 for cochlear and 0.94 for vestibular hydrops. The average MR imaging grade of endolymphatic hydrops was 1.27 ± 0.66 for 55 clinically affected and 0.65 ± 0.58 for 10 clinically normal ears. The correlation between the presence of endolymphatic hydrops and Menière disease was 0.67. Endolymphatic hydrops was detected in 73% of ears with the clinical diagnosis of possible, 100% of probable, and 95% of definite Menière disease. CONCLUSIONS: MR imaging supports endolymphatic hydrops as a pathophysiologic hallmark of Menière disease. High interobserver agreement on the detection and grading of endolymphatic hydrops and the correlation of MR imaging findings with the clinical score recommend MR imaging as a reliable in vivo technique in patients with Menière disease. The significance of MR imaging detection of endolymphatic hydrops in an additional 22% of asymptomatic ears requires further study. According to the 1985 American Academy of Otolaryngology-Head and Neck Surgery Committee on Hearing and Equilibrium guidelines, Menière disease (MD) is defined by ≥2 definitive spontaneous episodes of vertigo 20 minutes or longer, audiometrically documented hearing loss on at least 1 occasion, and tinnitus or aural fullness.1 In 1995, a clinical diagnostic scale was added with the categories possible, probable, definite, and certain,2 with “certain” defined as definite disease plus histopathologic confirmation. It is universally agreed that the pathogenesis of MD consists of endolymphatic hydrops (EH), but a simple cause-effect relation between EH and clinical symptoms is not present. Moreover, EH appears to be an end point of different etiologies such as trauma,2 viral infection and autoimmune processes,3 electrolyte imbalance,4 and cellular channelopathies.5 Histopathology has provided evidence that not every individual with EH presents with symptoms of MD6⇓–8 and not every individual with the clinical diagnosis of MD has EH.9⇓⇓–12 Only recently has MR imaging enabled depiction of EH,13 opening a window for in vivo confirmation of EH. The purpose of our study was to assess the degree of EH in 53 patients with MD and to correlate the MR imaging findings obtained by a specific protocol with the certitude of clinical diagnosis. From June 2012 until April 2013, sixty-three patients, 27–72 years of age, female/male = 21:42, with the clinical diagnosis of definite, possible, or probable MD were referred for 3T MR imaging of the temporal bone to demonstrate EH and to exclude other causes of vertigo and hearing loss such as vestibular schwannoma. Nine patients with motion artifacts and 1 patient with the MR imaging diagnosis of hemorrhagic labyrinthitis were excluded from analysis. With institutional approval for the study and patient informed consent, the MR imaging data of the remaining 53 patients (106 ears) were retrospectively analyzed. All patients underwent 3T MR imaging of the temporal bone by using a 32-channel phased array coil to rule out schwannoma or other causes of the symptoms. Following a delay of 4 hours after intravenous contrast administration (Gadovist; Bayer-Schering Pharma, Berlin, Germany; 1.0 mmol/mL at a dose of 0.2 mmol/kg), a 3D real inversion recovery (3D-IR) sequence13 was performed with the following parameters: FOV, 190 mm; section thickness, 0.8 mm; TR, 6000 ms; TE, 177 ms; number of excitations, 1; TI, 2000 ms; flip angle, 180°; matrix, 384 × 384; bandwidth, 213 Hz/pixel; turbo factor, 27; scan time, 15 minutes. The MR images were qualitatively analyzed by 2 experienced neuroradiologists (K.B. and B.S.) blinded to the side, uni- or bilaterality of symptoms and the clinical score of MD. On the basis of previous histopathologic observations,14 EH was categorized as none (Fig 1A), grade I (Fig 1B), and grade II (Fig 1C). Hydrops of the cochlea and vestibule was separately assessed by visual comparison of the relative areas of the nonenhanced endolymphatic space versus the contrast-enhanced perilymph space. A, Normal labyrinth: interscalar septum (thin arrow), scala tympani (large arrowhead), osseous spiral lamina/cochlear duct (thick arrow), scala vestibuli (small arrowhead), saccule (dashed arrow), and utricle (dotted arrow). B, Cochlear hydrops grade I with irregular dilation and partial obstruction of the scala vestibuli (arrows). In vestibular hydrops grade I, dilation of the endolymphatic space (dotted arrow) encompasses >50% of the vestibulum. A circular perilymphatic space (dashed arrow) remains visible. C, Cochlear hydrops grade II with total obliteration of the scala vestibuli (arrows). In vestibular hydrops grade II, dilation of the endolymphatic space leads to effacement of the perilymphatic space (dotted arrow). Statistical analysis for interobserver agreement on detecting and grading EH was performed by using the Cohen κ test. To test for independence of MR imaging and clinical results, we used the Pearson χ2 test (when the clinical grading was simplified to normal and abnormal ears), and the Fisher exact test, when the clinical score was 4 levels (normal ears and ears with possible, probable, and definite MD). All tests were performed in R (Version 2.14.2; http://www.r-project.org/) and RStudio (Version 0.97; http://www.rstudio.com). On the delayed 3D-IR sequence, the normal cochlea displays the interscalar septum, scala tympani, osseous spiral lamina/cochlear duct, and scala vestibuli (Fig 1A). In the normal vestibule, the added surface areas of the saccule and utricle are less than half the area of the vestibule at the midmodiolar level (Fig 1A). Grade I cochlear hydrops was defined as mild dilation of the nonenhancing cochlear duct, sparing parts of the enhancing perilymph of the scala vestibuli (Fig 1B). Grade I vestibular hydrops presented as distention of the endolymph space of the saccule or utricle or both, with the perilymphatic space still visible along the periphery of the bony vestibule (Fig 1B). In grade II cochlear hydrops, the scala vestibuli was uniformly obstructed by the maximally distended cochlear duct (Figs 1C and 2). In grade II vestibular hydrops, the bony vestibule was entirely encompassed by the dilated endolymphatic spaces (Figs 1C and 2). A 3D-IR sequence depicts cochlear EH grade II (thin arrow) and vestibular EH grade II (thick arrow) on the right. EH is not visible on the corresponding 3D T2-weighted spatial and chemical-shift encoded excitation (SPACE) sequence. No EH on the normal left side is seen. Normal anatomy is shown at different levels (below the midmodiolar, midmodiolar, and above the midmodiolar sections) on the 3D-IR (0.8 mm) and 3D heavily T2-weighted SPACE (0.4 mm) sequence: interscalar septum (thin dashed arrow), anterior ampulla (thick dashed arrow), utricle/common crus (thick dotted arrow), and the lateral ampulla (arrowhead). EH was not visible on the 3D heavily T2-weighted spatial and chemical-shift encoded excitation sequence obtained at a 0.4-mm section thickness (Fig 2). Cochlear hydrops was present in 53 ears (grade I in 35 and grade II in 18 cases), and vestibular hydrops was detected in 56 ears (grade I in 30 and grade II in 26 instances). Cohen κ test for interobserver agreement was 0.97 for cochlear findings and 0.94 for the vestibule (normal and abnormal). 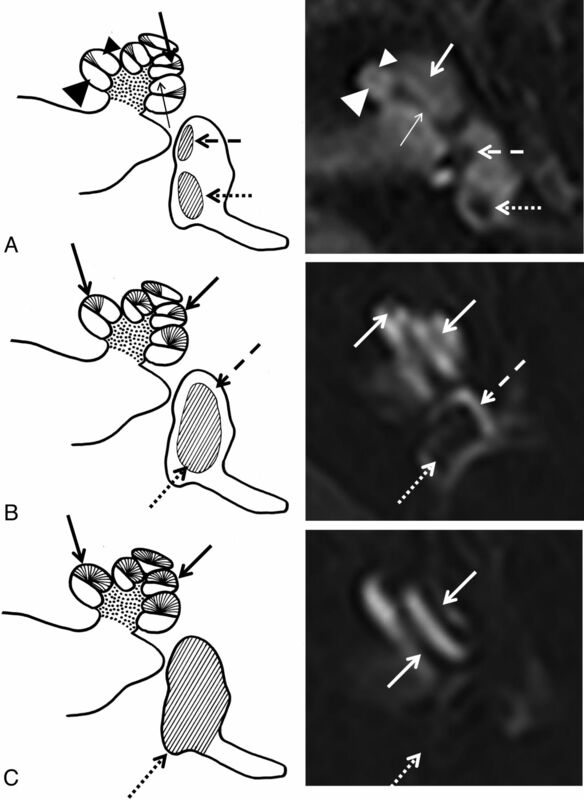 The average MR imaging grading of EH was 1.27 ± 0.66 for 55 clinically affected ears (55 cochleae and 55 vestibules) and 0.65 ± 0.581 for 10 clinically normal sides (10 cochleae and 10 vestibules). Ninety percent (55/61) of clinically diseased ears had EH on MR imaging, whereas 78% (35/45) of the clinically normal ears had no EH on MR imaging (Fig 3A). The results proved significantly different from chance (Pearson χ2 test with the Yates continuity correction, χ2 = 47.5754, df = 1, P < .001). Conversely, 22% (10/45) of clinically normal ears showed EH on MR imaging, and 10% (6/61) of ears with a clinical diagnosis of MD did not show EH. EH is present in 22% (10/45) of clinically normal ears and in 90% (55/61) of clinically diseased ears (irrespective of clinical score) (A) and in 73% of ears with possible (11/15), in 100% in ears with probable (3/3), and in 95% (41/43) of ears with definite MD (B). Of the 10 ears with asymptomatic unilateral EH, MR imaging in 9 ears (92%) depicted grade I EH in either the cochlea (n = 3), the vestibule (n = 5), or both (n = 1). Only in 1 case was grade II vestibular EH present in addition to a grade I cochlear EH. The correlation between the presence of EH and the clinical score (normal ears and ears with possible, probable, and definite MD) was 0.67 (Spearman ρ, P < .001). EH was depicted in 73% (11/15) of ears with the clinical diagnosis of possible MD, in 100% (3/3) with probable MD, and in 95% (41/43) of sides with definite MD (Fig 3B). These percentages are significantly different from chance (Fisher Exact Test for Count Data, P value < .001). Since the first publication of MR imaging visualization of EH in an animal study in 200115 and MR imaging demonstration of EH in patients with MD following intratympanic injection in 2007,16 numerous studies have tried to visualize EH by using different routes of administration of contrast media, such as intratympanic16 versus intravenous17⇓⇓–20 and by altering intravenous dosage regimens (single,13,17 double,18 and triple21 dose). Additional variations included technical parameters such as the number of receive channels of the head coil (8,22 12,23 and 32,17) and a variable choice of sequences such as 3D-FLAIR,23,24 heavily T2-weighted 3D-FLAIR,24 and 3D-IR sequences.13 On the basis of previous demonstration of the feasibility to separate the endo- and perilymphatic space 24 hours after intratympanic gadolinium injection by a 3D-IR sequence13 and the observation that perilymphatic enhancement occurs 4 hours after intravenous contrast administration,21,25 our protocol comprised a 3D-IR sequence obtained 4 hours following intravenous injection of contrast media. The intravenous route of contrast administration is also less invasive and renders perilymph enhancement independent of the status of the round window membrane.26,27 In a comparative study in patients with MD, however,28 intratympanic contrast injection provided higher perilymphatic signal compared with intravenous administration. An additional advantage of the intravenous method is simultaneous examination of both labyrinths because provided the disease manifestation is unilateral, the nondiseased ear serves for comparison. A caveat to this, however, is that asymptomatic EH had been observed by histopathology in 5%7 and 26%8 of postmortem examinations without documented MD. Finally, intravenous application of the contrast agent renders the function of the blood-perilymph barrier visible. In accordance with others,24,28 gadolinium uptake was more pronounced in symptomatic compared with asymptomatic ears in patients with unilateral EH in 90% of our cases (Fig 4). Predominant saccular dilation: 3D-IR sequence (right and left side of the same patient). The right side shows a dilated saccule (arrow) and a slightly distended utricle (dashed arrow) with grade I cochlear hydrops (dotted arrow). Note increased contrast enhancement of the perilymph on the symptomatic right side compared with the normal left labyrinth. In 1938, Hallpike and Cairns29 described histopathologic changes that consisted of gross distention of the cochlear duct and predominant dilation of the saccule as opposed to the utricle. In most cases of our series, however, vestibular hydrops was not attributable to either the saccule or the utricle (Fig 1B, -C), and only rarely a preferential distention of the saccule (Fig 4) or the utricle (Fig 5) was observed. The saccule is located anteromedially in the pars inferior of the vestibule, while the utricle is posterior within the pars superior.30 Because visual assessment was based on axial images at the widest part of the vestibule (Fig 2), dilation of the vertically oriented saccule may have been underestimated in comparison with the horizontally positioned utricle. Cochlear hydrops, an apical distention of the cochlear duct as a normal finding31 and the interscalar septum (Fig 2), can be confidently identified at this level as well. Predominant utricular dilation: 3D-IR sequence left side. Marked distention of the utricle (dashed arrow) and sparing of the normal-sized saccule (arrow) leave the perilymphatic space visible (grade I) with no cochlear hydrops. The interscalar septum (dotted arrow) should not be mistaken for a slight cochlear hydrops. MR imaging grading of EH is meant to assess the presence and degree of EH in patients with different clinical scores of MD. The definition of a cutoff value of >50% required for vestibular hydrops grade I was derived from 41% of the total volume encompassed by the saccule and utricle.33 Grade II was present when the entire vestibulum was occupied by the endolymph space. The MR imaging grading proposed by Nakashima et al34 probably overestimates “mild hydrops” when defined as “one-third and a half ratio” of endo- to perilymphatic space. Belal and Antunez6 found an incidence of EH in 9% of 703 temporal bones, including normal ears and ears with various pathologies. By histopathology, Rauch et al7 and Merchant et al8 found EH in 5% and 26% of temporal bones in patients without previous symptoms of MD. The latter figure corresponds to an incidence of 22% in clinically “silent” ears in our series. EH was found on the clinically affected side in 55/61 ears (90%). Histopathologically, Fraysse et al12 described similar results in 93% of 21 affected ears. The detection rate was 73% in ears with clinically possible MD (Fig 3), 100% in probable, and 95% in ears with definite MD in our series. The severity of hydrops was significantly more pronounced for 55 clinically affected ears, with an average grade of 1.27 ± 0.66 in comparison with an average grade of 0.65 ± 0.581 for 10 clinically normal sides. Accordingly, Sperling et al33 found a tendency for more severe EH to occur in symptomatic cases and comparatively less EH in asymptomatic cases. In patients with MD, a dedicated MR imaging protocol depicts cochlear and vestibular EH in vivo. In accordance with histopathologic data, 10% of patients did not have EH in the affected ear, while EH may be present in clinically silent ears of patients with MD. A high interobserver agreement on detecting and grading EH suggests that this MR imaging grading method is robust. The authors thank Irini Paschalis, Laura Kopácsi, Andreas Schiller, Kathleen Sullivan, and Stefanie Schuknecht for their support of this work. B. Schuknecht shared first authorship with K. Baráth. Disclosures: Bernhard Schuknecht—UNRELATED: Consultancy: Antisense Pharmaceutical Company (Regensburg, Germany), Comments: TNF β treatment in gliomas. Stefan C.A. Hegemann—UNRELATED: Expert Testimony: SUVA, Payment for Lectures (including service on Speakers Bureaus): As a lecturer at Zurich University, I get a small amount of money for my lectures and student courses. It has absolutely nothing to do with the submitted study, Patents (planned, pending or issued): I have a patent pending (PCT/EP2013/052595), which also does not concern this study, and I still do not receive any money from it but, hopefully, will eventually, Payment for Development of Educational Presentation and Travel/Accommodations/Meeting Expenses Unrelated to Activities Listed: I sometimes give talks at conferences or courses that are supported by industrial sponsors, who also paid me some money (for my talk as well as traveling and accommodation). One sponsor I remember is Interacoustics (Drejervaenget 8, Assens, 5610. Denmark, www.interacoustics.com). Accepted after revision November 20, 2013.